I've made 752 guitars, 367 violins, 124 violas, 67 cellos, and 4 upright basses. So of course I am right because I doubt you have made more than 1314 stringed instruments. By my standard (and seemingly the standard of many lumber mills who display pictures on their website) it's quarter sawn. By lumber mills' standards, quarter sawn can have a grain angle between 45 to 90 degrees (though usually 60 to 90 degrees is a higher spec). You have the right to disagree, and in so doing call Ken Parker a liar, but clearly you are just using a different standard. Well, turns out my post was totally F.O.S., so I thank you all for not handing me my head. 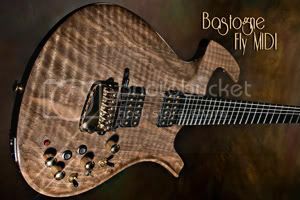 Just out of curiosity, is the maple used for Fly guitars (or archtops or flattops) quartersawn or is it slab-cut? How 'bout Mahogany? And Oak used for furniture? I always see that referred to as 'quatersawn', but don't always see the vertical grain. What I am getting at here, is the question about Poplar. Is the poplar used, say, in Bubbles quartersawn? How bout the Koa in Olive? How bout the maple in Mrs Natural? or the Aspen in Spot? or the German Maple in Grace? Would the grain that's so clear and tight in spruce, but presents as not-so-symmetrical vertical grain in maple, be what is referred to as the medullary grain? I am wondering if perhaps Poplar doesn't have the same presentation as spruce or cedar? Or, for that matter, need it in a solid-body configuration. Just curious, cuz if Maple and mahogany are quartersawn for these instruments, and doesn't display the tight grain we see in spruce and cedar, mightn't poplar as well? (the Tulipwood is actually a type of poplar, rather than the Tulipwood that is more like Rosewood...). Could it be that Tulipwood Poplar has a very inconsistent medullary grain pattern and, as such, might not appear as consistent and tight as spruce or cedar. Indeed, might it be named for its odd medullary pattern? See, I don't really know much about this. Folks? You know, there's always the possibility that some of these guitars (#7 inclusive) were milled from the outermost wedge piece, or one adjacent to it, if the trees were of suitable size, right? A tree two and one-half feet -- or more -- wide would yield quarters half that -- enough for a Fly? I don't know enough about it - the wood closest to the bark being discarded due to marked difference in hue, etc. The ad for the guitars DID say, "solid piece of Tulipwood quartersawn from large trees native to the eastern U.S. Each guitar shows light figuring running perpendicular to its wide grain which is enhanced by a lush transparent emerald finish." That reads like a description of my (and Mark's) #7 to a tee. Furthermore, light figuring (I don't think) wouldn't be referring to the tight linear grain pattern of quarter-sawn wood. My thoughts exactly. As stated, there are only a few pieces that will be perfectly quarter sawn. Everything else will have less perfect angles in the grain, especially considering the size of the tree. Ultimately, I really doesn't matter. As I've heard second-hand from a person who spoke to Ken Parker about the Tulipwoods, "Ken told me that all of the Deluxe models were made of "Tulipwood" but that he had the staff watch for especially nice pieces with the best wood grain to make these guitars. They were not all made at once as they were very picky about the selection and when they had enough to make 3-4 of them they did so. All Poplar wood isn't the same and he selected this species of "Poplar" especially for the Fly. I do not claim to know about wood classification but I would have no reason to doubt the man himself!" I trust that Ken felt the wood used for the Tulipwood was unique enough in comparison to the standard Deluxe models to create the limited edition guitars. We are looking at examples from the past and microscopically examining them and comparing them to press releases that Ken may have never even read. I do know this - that he did and still does concern himself primarily with making whatever is in front of him the best that it can possibly be - or even better than that (witness building an exoskeleton for thinly carved bodies - better than the wood would have ever been on its own for this purpose). I don't know how the wood came into Parker or whether there was a choice in how it was carved once there (ie: slight rotation on the quartersawn planks to bring out the most interesting grain patterns for each guitar or the best sound for each guitar or both). Even now, he's considering popping the top on on one of his earlier archtops and adjusting the bracing to lighten it up based on the guitars he's built since. He's a perfectionist to the nth degree - one that really didn't concern himself with marketing, but only with making the Fly that was in front of him be the best guitar it could. I know - it's a skating answer, but it's an honest one. I don't know any luthier that has greater attention to detail than Ken Parker - and I know if a piece of wood said "um, I'm better as a slap cut than a quartersawn cut" to him, he'd evaluate and do what he thought best. OK, here's the most detailed shot I could get of the back of Bubbles. You can see some of the medullary grain here, but you can see how erratic it is. Is this quatersawn? It's what Ken calls Kissed Poplar, but has the official name of Blistered Poplar. Sorry, but my interest is piqued. The second image seems to have a few things going on. A tighter, much more pronounced medullary grain AND the figure you see on the face of Titus' guitars. SO, is it possible that the presentation of the medullary grain is minimized AND it's got erratic grain - more like Bubbes - unlike the image above? Looks like quite a few variables here. I believe Titus was able to get some information, from a very good source, that would support what I originally said and my whole position. That some of the Tulips were quarter sawn and some were slab or "flat" sawn. Without sharing the specifics Titus can you back me up here? It was never a discussion about how unique the wood was. It was a discussion about what was quarter cut and what was not. You now know I was correct. Be big enough to admit you were wrong. It's good to see such a lively and spirited debate here. Emotionally, it seems to have jumped the shark just a bit. Essentially, the response from the 'very good source' says that when using soft woods such as spruce or cedar for sound boards on acoustic instruments, the best quarter sawn wood is a must. Even for the Flys that were made from soft woods, for structural integrity, he chose the best quarter sawn. He also indicates that there are degrees of cut that qualify for quarter sawn. HOWEVER... the 'very good source' stresses that for the solid body poplar guitars, or any solid body guitars that are made from hardwood, flat sawn, such as the poplar, was/is perfectly fine. As a hardwood, it's structurally suitable for its purpose and would never necessarily need to be quarter sawn - from a structural, expense or other perspective - for use as a solid body guitar. 1. Titus asks about Simon's guitar: "Are these plank or quarter sawn?" 2. cy2989 responds: "that one is obviously slab cut. Beautiful though." As much as it may not have mattered, Titus asks a question that sparks a perceived sense of 'quality' about how the wood was cut to make the guitar. cy2989's answer plays to that implying that in spite of its status as being slab cut, it's still beautiful. And it escalated from there. At this point, it's simply a given that quarter sawn is better for these guitars when, according to the 'very good source', it isn't. So, the entire thread - that got a bit heated - is really not so much about what is quarter sawn, although it certainly did qualify what quarter sawn is, but about whether someone's guitar is better or worse because of it. I hate to say it, but the entire thread hinged on the word "though" as it immediately, intended or not, evaluated the Tulipwoods that weren't quarter sawn as somehow lesser instruments, creating offense/defense posturing. The 'very good source' also goes on to say that he, over time, saved boards that were particularly nice examples of the poplar for a transparent finish run. And finally, he goes on to say that he didn't pay a lot of attention to marketing speak - and had no idea how the term 'quarter sawn' made it into the press releases. I certainly believe that, as I stated in my earlier post about this. SOOOOO... everyone... this is still, for the time being, the coolest forum on the internet, so let's let cooler heads prevail and say that everyone had a valid point to make. Chris, you were right in explaining what quarter sawn is and illustrating how a log is cut. Mark, you were right about the degrees that actually can qualify for a quarter sawn classification. Nobody was right about whether quarter sawn is better or more desirable in solid body guitars made of hardwood. And anyone who linked Ken Parker directly to the press releases was just plain wrong. All in all an EXCEPTIONALLY informative post. If you read my replies, I stated over and over that a slab cut board for a solid body guitar is not an undesireable thing and in fact might even be more desireable because of the more interesting grain patterns. This discussion was never about whether QS was more or less desireable in a Fly. I was responding to a question about whether Simon's guitar was QS or not. It's not. I tried to explain why it's not and the whole Tulipwood example came up. As I stated about that, not all Tulips are QS either. I was then told that "I was full of cr*p" and that I was somehow calling Ken Parker a liar. I'm not getting emotional, I just want people to admit when they're wrong and an apology for saying I'm "full of cr*p" (which was uncalled for) would be nice too. This WAS a discussion about what QS is and is not and about whether the Tulips were QS as stated in the marketing hype. Well, they aren't and that's all I said. What bothers me most is that Simon wins again! Remember, the 'source' also praised Butternut as a wonderful sounding wood and wished he could have found more of that material! If I could imitate Newman's voice from Seinfeld I'd say ... "Simon!" in just that way - he's won. AGAIN!! Seriously, though, my Tulipwood is a wonderful guitar, as I'm sure all the LE Tulipwoods are. The fact that mine isn't what qualifies as a true slab of good quarter-sawn lumber isn't a huge deal to me at all. It sounds, plays and looks wonderful. This same source also said he'd be glad to look at the guitar to help ID the guitar's cut, etc. I lament the day that source took off (and the fact I don't have the change for one of his current works). And, Bob, you forgot to add that Mark was spot-on in that quote from a second source concerning the woods in the LE Tulipwood. And that shot you posted of the poplar DOES look a lot like the grain on #7. And Chris, you were spot-on in your explanation of quarter-sawn wood. That's true, Chris. Some were and some were not. The boards for the LE were collected over time (pulled from production stock used for painted Deluxe models) due to their unique character. Evidently, a number were quarter-sawn, but that exact number is unknown.